Anderson Varejao flashed borderline NBA Allstar potential in the years after Lebron’s first sabbatical. He was a pesky carnivore on the offensive boards and developed a reliable mid-range jumper to keep the lowly Cavs in the nightly hunt. 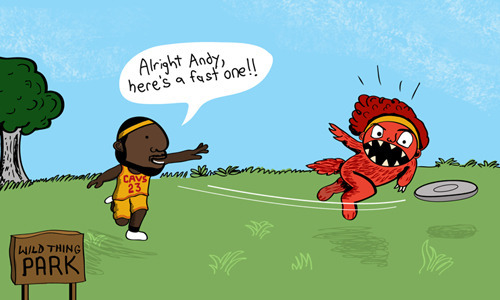 Despite injuries, Andy’s game looked clean. When Lebron returned to the Cavs, their old chemistry heated right back up. It was a beautiful thing. Their ‘passmanship’ developed year after year. Obviously, I figured that special connection came from all those hours spent chuckin’ frisbees at ‘Wild Thing’ park!